Shortboard winners, Kayla Coscino, Claire Kelly and Destiny Thompson. In a league event against Newport Harbor, the LBHS girls surf team were big winners though Laguna was six points shy of the win 81 to 87. 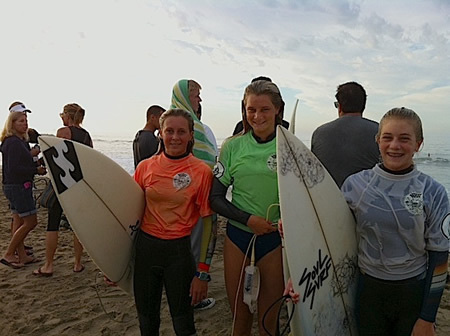 In the shortboard Kayla Coscino placed first, Claire Kelly took second and Destiny Thompson was third. Lola Fisher took her first longboard win while Kayla did double duty and had an impressive third place finish. Spencer Davis took second in bodyboard. Noah North opened the day with a second and Nate Madigan took third. Travis Booth looked on his game taking second and Jake Levine had a third. In the final heat of the day, Jeremy Shutts took a big win, ripping on a borrowed board after breaking his in the morning warm up, his second in a week. Liam McCue also put in a noteworthy performance with a buzzer beater to take third.